People at risk of dying suddenly from genetically-inherited heart conditions may be able to get a quicker diagnosis and treatment following the opening of a new gene sequencing lab at the Mater Hospital in Dublin. 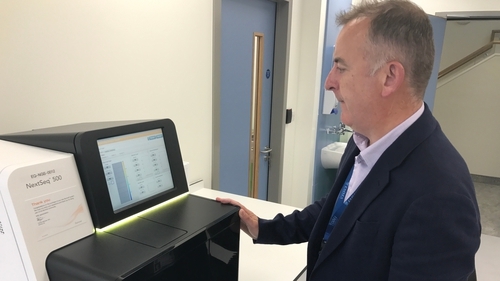 The Next Generation Sequencing Laboratory will also be used to help with the diagnosis and treatment of people with other conditions, including cancer and blindness, as well as assisting research in these areas. Costing €2 million, the equipment and lab were funded by the hospital, the HSE and a €750,000 donation from the Shabra Charity - the organisation set up to honour the late businessman and horse trainer Oliver Brady. Those behind the lab say it will help patients by enabling more gene testing services to be offered in Ireland, speeding up diagnosis and treatment as well as reducing waiting lists and costs. Although there are other genetic sequencing facilities in Ireland, they do not have sufficient capacity, meaning testing often involves sending samples to labs in the US, Spain, UK and Germany. In particular it is hoped that those at risk of Sudden Adult Death Syndrome (SADS) and of the genetically based BRCA1 and BRCA2 types of cancer will benefit. Around 250 people under the age of 35 are thought to be at risk from SADS. Genetic sequencing is rapidly becoming a fundamental part of modern medicine and key to providing so-called personalised treatments for particular conditions. University College Dublin is currently involved in research in the area, while a solid tumour molecular diagnostics service is available at St Vincent's University Hospital in Dublin. The Ireland East Hospital Group says it is working towards an integrated NGS service for the group and the country through the creation of a Genomic Directorate. Recently the Chief Medical Officer in Britain said all patients newly diagnosed with cancer should undergo routine genetic testing to avoid misdiagnosis and provide quicker treatments.